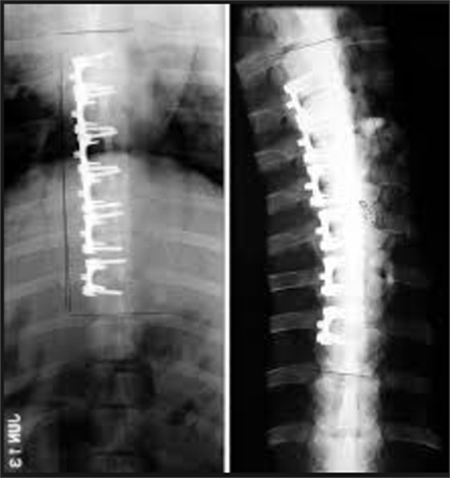 Fusionless scoliosis surgery is primarily used as a “standalone” procedure; in other words, fusionless scoliosis surgery (e.g., tethering or stapling) is the primary and only procedure, in most cases, where it is utilized. However, there may be instances where fusionless surgery is best used in conjunction with other scoliosis “fusion” procedures. Such “hybrid” procedures may provide a better long term outcome when compared to either “pure” fusionless or fusion procedures alone. A typical example would be a case where a double “S” pattern scoliosis exists. This means there is both a curvature in the thoracic (upper back) and lumbar (lower back) spine. The thoracic curve may be the more severe/structural curve where the lumbar curve may be the smaller/more flexible curve. In that particular instance, it may be of long-term benefit to perform a traditional fusion type surgery for the more severe upper curve and control the lower curve with fusionless tethering. Tethering of the lower lumbar curve can control and balance the alignment of the lower back, while simultaneously preserving the important functional role of the lower back. Also, avoiding fusion of large.